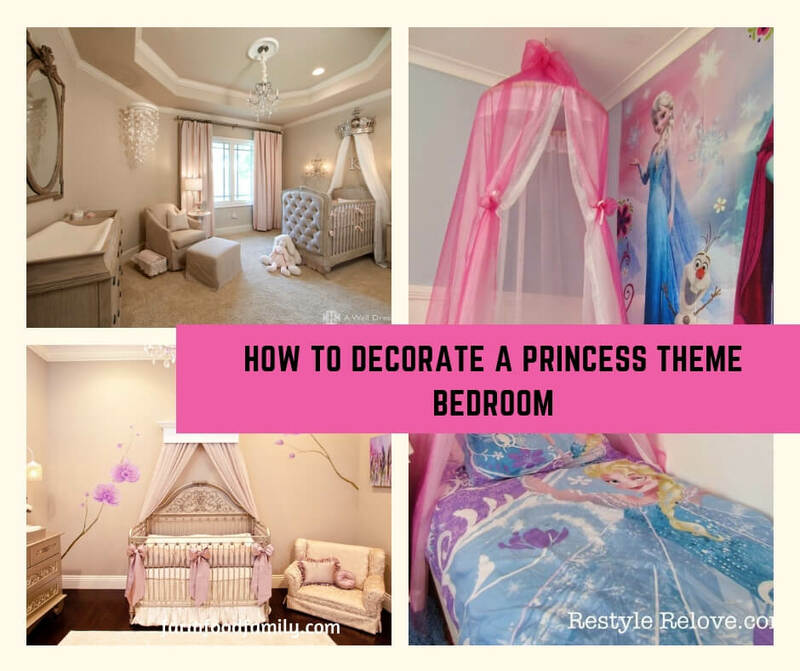 With creativity, decorating a princess theme bedroom can be done on a pauper’s budget. Use Disney nursery decor or an array of other theme options. The market is flooded with Barbie, generic princess, and Disney nursery decor. Going generic will save money, and the unnamed princesses also lend themselves to a traditional fairytale look that leaves more to a little girl’s imagination. The popular color schemes for a princess room fall among the shades of pastel pinks and purples. Most any princess theme décor will mix and match within these hues. There’s certainly an abundance of wallpaper to compliment a princess theme, but a fresh coat of pastel paint is probably the most affordable option. Once the walls are covered, parents may attempt the personal touch of a sprawling mural depicting a castle, horse-drawn coach, unicorn, or fairytale scene. Parents may opt for the equally attractive princess theme wallpaper border or a set of peel and stick wall decals. No matter what they settle on, they’re sure to see their little girl’s eyes sparkle when she sees the new room for the first time. Here again, there are a myriad of options when it comes to princess theme blankets, spreads, sheets, curtains, and rugs. The Disney and Barbie princesses have the advantage of being easily identifiable to little girls. But some parents can choose to keep the cost of decorating down by shopping for second-hand princess furniture and bedding sets, or opting for a princess look that skips the trademarks altogether. Why not make a little girl feel like she’s the true princess waking up in a fairytale with a shimmering gold/brass daybed, satiny pink spread, and velvet throw pillows? If a little girl already has a bed, why not customize it with her own lacey canopy? A royal canopy can easily be fashioned from inexpensive PVC pipe and tulle fabric. And then there’s the tower window to accessorize. Co-ordinating pastel curtains can set off the room nicely. They can even be dressed up with rhinestones and glitter. If the bedroom floor is hardwood, parents can find plenty of princess theme area rugs. They can also opt for a flowery rug in coordinating shades of pastels. Parents can make their little princess feel special by framing pictures of her in princess costumes or posing with a princess character. Personal touches like these fill a room with happy memories and make it an enjoyable place. Higher shelves are a great place to decorate with princess dolls, figurines, and storybooks. Choose books whose covers depict well-loved fairytale scenes and set them covers facing outward. Decorating with books is an inexpensive way to instill a love of reading. Now, all that’s left are the finishing touches. Little girls will enjoy helping to decorate the room with princess theme accessories such as crowns, wands, glass slippers, Mardi Gras jewels, tiaras, and gowns. Affordable places to find these accents are stores or websites selling party favors for themed birthdays. Parents will love watching their little girl’s imagination soar in her elegant new bedroom. And whether they went all out with Disney nursery decor or shopped generic, they can be sure she’ll feel just as special as a princess.